When it comes to getting six-pack abs, nutrition is always going to be number one. But when it comes to getting six-packs abs fast, it is the combination of nutrition and correct workouts that will get you serious results. Below I have outlined the top ten exercises you can do when it comes to getting six-pack abs. Some of these may surprise you, but they have been tried and tested and will bring incredible results. By now if you have been reading our six-pack abs series, you can see how much I love sprinting. Sprints are in fact the only cardio workout that I ever do. Whether this is a sprint workout outside on the grass, indoors on a basketball court, or on a rowing machine; sprints are where the results are at! 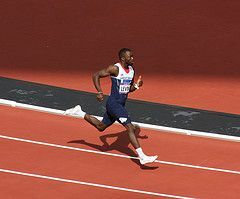 Sprinting can be defined as “anything you do for a short period of time at the highest intensity that you can safely go at, then rest and repeat.” Put simply: move very fast, recover, do it again. Sprints are the ultimate six-pack abs workout. Not only will they burn fat, but they will also make your abs “pop” like never before! Many times when people hit plateaus, incorporating sprints can help push them past the plateaus and into even better fitness levels. In comparison, a spin class will burn you 9.8 calories per minute. So kettlebell swings double that of a spin class in terms of calories burned per minute! Pretty sweet deal. The ultimate full body workout, that will burn tons of fat and build ripped lean muscle. 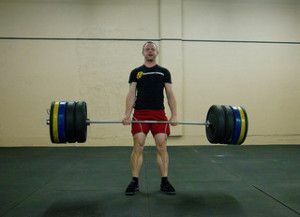 When doing deadlifts, you are activating nearly all the muscles in your body. Deadlifts are extremely demanding on the body but this means you are literally forcing the body to build lean muscle and burn fat. Don’t be afraid to pick up some serious weight when it comes to deadlifts. Start off light but over time work on building up to lifting more weight. Deadlifts will not make you bulky. Instead it will help put on lean muscle and burn tons of fat! Squats, although known as a strength and power exercise, bring some great benefits when doing them regularly. Not only will they build lean muscle, but they will also help with continued fat burn after your workout is over. Squats take a great deal of effort, putting a lot of stress on the body. So by squatting you are forcing your body to work very hard, essentially forcing it to burn more calories and more fat. For best fat loss results, I have found working with a challenging weight doing 6-10 repetitions and resting 45-60 seconds between sets works best. This style of training will help increase growth hormone levels, which as we know is what aids in keeping us strong, lean, and healthy! The pull-up is often avoided by so many because it is a very difficult movement. I encourage you to push through and start working on getting better at them. 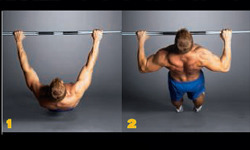 Start with jumping pull-ups or inverted row to help build up strength! Pull-ups greatly involve using your core so not only are you strengthening your upper body and back, but you are building a solid core and building your six-pack abs! The add on to the squat. Thrusters are an incredibly demanding exercise that involves doing a front squat to shoulder press. If you are looking for some serious burn throughout your whole body, do this! Push-ups help boost your metabolic rate which in turn means you will burn fat at a more rapid pace. Push-ups can be added on to just about any workout and will really help in improving your strength and strengthening your core! Burpees are a great definition of the ultimate high intensity workout. They involve using the whole body and will leave you very out of breath by the end. The combination of strength training and cardio shows great results in terms of fat loss and caloric burn. Burpees can be best used as a finisher to a workout, or as an interval cardio workout. Jumping workouts can include box jumps, jump rope, single leg jumps, leap ups, step jumps, dunking, etc. Jumping uses your whole body and really engages your core. If you were to feel your abs when you went to jump, they would be engaged and very tight. A strong core is essential if you want to improve your jumping. Jumping is another great cardio workout that will burn tons of calories, eliminate fat, and build lean muscle. Oh yea, and it will make you jump higher. As my dad once told me: “If you want to jump higher… JUMP!” Great advice! When I started incorporating bent over rows into my workout routine, I was amazed at how fast results started coming. My back started feeling stronger than ever before and my low back pain, which I had been experiencing, was almost immediately eliminated. Not to mention, this is a great exercise that engages your core and builds lean muscles throughout your entire back! This is an article about six-pack abs yet I have not stated one “ab exercise” yet. That just shows the power of the exercises above. If you want your six-pack abs to start showing, your focus should NOT be on ab exercises. Instead, ab exercises should be an add-on to your workout! This is an incredible move to help build great core strength and eliminate low back pain. The best part is it caters to all fitness levels and can be easily adjusted to make it more advanced or more for a beginner. To kick this workout up a bit, try doing it with your arms on a stability ball. According to one study, it makes the exercise 30% more effective! An exercise, that when done correctly will bring some great results. This will really help build up your ab muscles and core, as well as strengthen your hip flexors and back. Tim Ferriss swears by this movement and I agree 100% with him. Unlike the regular floor crunch, the myotatic crunch allows you to extend much further, letting your abs really stretch and build more strength. 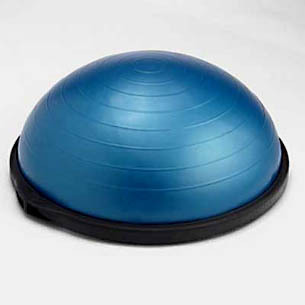 Use a Bosu Ball or Swiss ball for best result. A decline bench will also work for this exercise! An advanced move that will really help your abs grow. 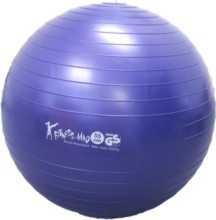 Start by performing ‘knees to chest’ on the stability ball and move up to performing the stability ball jack knife! This can be done on an ab wheel, barbell, or stability ball. Start by doing very little repetitions (5-10) and build up to doing more. This exercise will engage your whole core so if you start out to strong you will be incredibly sore the next day. Your abs are an important muscle to train, yet ab exercises should be used as an add on to your workouts. They should not be the focal point of getting six-pack abs. If you are looking to get serious results, burn unwanted fat, and build lean muscle; follow the exercises outlined above and add in the ab exercises we just went over. Your abs are just like every other muscle in your body in the sense that they should not be trained everyday. They need a rest in order to recover and grow. After going through the list above, all the exercises have one thing in common: they all involve using more than one body part! Notice how you didn’t see bicep curls or hamstring curls on the list. While there is a time and place for these kinds of movements, if you are looking to get results fast you must start incorporating the exercises above and adding in the ab exercises at the end of workouts. Remember that you should not train the same body parts or muscle groups every single day. It is important to allow them to rest, so they can recover and grow. It is recommended that you have at least a days rest in between weight training workouts and incorporate abs every other day at most. This will ensure that you are giving your body enough time to recover! In part five of our series, I will be covering some different elements that may be holding you back from getting six-pack abs! There are going to be some factors that I will cover that many of us do every single day, that are greatly holding us back from getting the results we desire. So be sure to check back for part five! Don't Feel Like Working Out?